It may seem odd but the cause of your headaches can actually be the very thing you are taking to relieve them. Medications for headaches may provide immediate pain relief but if you are ingesting the medication more than a few days a week there is a high potential for overuse of the medication. This overuse can result in a rebound headache, where you experience headaches directly from medication use while still taking the medication, or afterwards from withdrawal. You may be adding to your headaches as opposed to reducing their frequency and alleviating your head pain. When you take medication too often or in too high of a dose, your body is more likely to adapt to the medication. Even following directions exactly doesn't mean you are safe from rebound headaches. The unfortunate reality is that almost any medication has the potential to cause a rebound headache and it will depend a great deal on your health status, medical history and quite simply, how your own body responds to the medication. It may, in fact, only be when you perhaps miss a dose of your headache medication that you realise your head pain is more intense than it was prior to commencing treatment. There is no one type of head pain that occurs with rebound headaches. You may find that you experience an intense throbbing headache or a dull constant one. Is Your Head Pain a Rebound Headache? One challenge you may face is to distinguish between a rebound headache and one that is a migraine or tension headache. Your doctor may ask you if your headaches are more intense following exertion. A rebound headache is generally not strengthened by activity whereas a migraine does tend to intensify or increase in frequency after exertion. A rebound headache is also less likely have the characteristic and classic migraine symptoms of sensory disturbances and vomiting. Which Medications are the Top Offenders? There has been some suggestion that any medication has the potential to cause a rebound headache but there are still some drugs that are more likely to cause problems than others. Popular over-the-counter medications such as acetaminophen and ibuprofen may lead to rebound headaches. If taken in moderation and on an occasional basis, however, they are generally safe and you should be able to avoid any complications from overuse. Some over-the-counter painkillers are sold in combination formulas, where other ingredients support or enhance the active pain relief ingredient. Many of these contain caffeine that is then added to drugs such as acetaminophen. The potential for overuse is higher with these and even drinking coffee on a daily basis can compound the effect. Some migraine medications have been indicated in rebound headaches; these include ergot preparations and the triptans. In addition, any pain relief drugs developed from opium tend to have a high potential for overuse, which can lead to particularly intense rebound headaches. Medications with codeine are another culprit and should be used with caution. 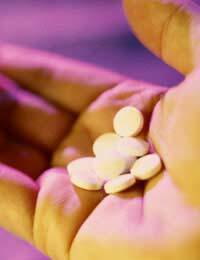 Can Headache Medication Overuse Be Avoided? By keeping headache medication use limited to two to three days a week, most people can safely avoid medication overuse. If you experience chronic headaches, however, and rely on daily medication, this task will prove quite difficult. With your doctor's approval, you may be able to alternate between two or more different medications. For example, you could take two different headache medications over four days during a week. Essentially, the only way to truly eliminate rebound headaches is to reduce or stop taking the medications that are causing them. The flip side to this method is that you're then left with more of the original headaches you were using the medications to treat. Unfortunately, this still leaves you with non-medicating painful days and there is no perfect plan that can guarantee headache free days without the possibility of medication overuse. Ideally, the root cause of your headaches can be addressed such that medications are only a temporary and occasional means for alleviating pain. You're much more likely to cause rebound headaches by taking too much of the prescription headache medication. Only take the amount and frequency prescribed by your doctor or according to the label on over-the-counter preparations. If you have any confusion when purchasing a prescription or non-prescription painkiller, ask the pharmacist for clarification. In addition to rebound headaches, overuse of headache medication may also result in stomach ulcers or liver and kidney problems. The last thing you need is to replace one source of pain with another more complicated one, so follow your doctor's dosage instructions, read labels carefully and try to find non-medication ways to relieve headaches whenever possible. This can help you to reach your goal of being free from headaches, migraines and medication pain.